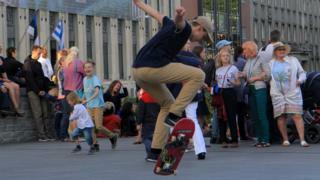 Political parties in Estonia are offering skate parks and other teenager-friendly policies when 16- and 17-year-olds vote for the first time in forthcoming local elections. Around 24,000 young people are shifting the dynamic in October's municipal elections, and the country's politicians are making big promises in an effort to secure their votes, the Postimees newspaper reports. Promising a skate park is Tallinn mayoral candidate Rainer Vakra, who notes that official attempts to discourage skating in the city's Freedom Square only resulted in youths using newly-installed barriers to "grind" their boards against. "I listened to the real experts," he said of his young potential voters. But his approach has been condemned by his political rivals. Mart Helme of the Conservative People's Party accuses him of "brainwashing students", and says that "politics should be kept out of schools", as debate rages as to whether teenagers are mature enough to recognise election issues. One person who thinks teenagers deserve the vote is 15-year-old Joosep Kaan, who will turn 16 in time to take part in October's poll. Writing in Postimees as a member of the Estonian Student Council, he says that "the right to vote will increase the motivation for young people to be informed and talk about issues". Saying that new voters are probably better informed than older generations due to their immersion in social media, Kaan still thinks youngsters - especially in urban areas - will have their heads turned by big election promises. "A skate park here, a bicycle path there. Young people are rather ignored in smaller places," he says.